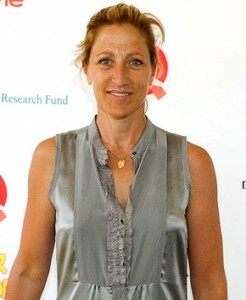 Edie Falco doesn’t go overboard shopping for her children, Anderson and Macy. Falco, who adopted her Anderson in March 2005 and Macy in April 2008, says she asks her 94-year-old grandmother for parenting advice. “[She] raised five kids who back in the day was doing everything. Grandpa was out making the money, and grandma was feeding one kid with her hand and rocking another kid in the cradle with her foot,” says Falco. “You can come to loggerheads if you don’t learn how to breathe and learn how to let them take the time they need. You have to let them be sometimes — to let them look at a book to let them brush their teeth,” adds the Emmy winner.